When a new health fad hits the airwaves, reporters know they can turn to UC Cooperative Extension for sound, sensible input. That's what Barbara Feder Ostrov of the San Jose Mercury News did for a story on chia, a food best known for the fact that it grows, curiously, on the outside of pots. Who hasn't see the television commercials showing pots shaped like animals or even a human head spouting the green grass-like growth of chia seeds? According to Ostrov's article, chia seeds are the newest health rage. They are are high in protein, fiber, calcium and higher in omega-3 fatty acids than flax seeds, the story says. Online retailers report rising sales and the product was plugged on CBS News and Oprah Winfrey's show. For the voice of reason, Ostrov turned to UC Cooperative Extension nutrition specialist Sheri Zidenberg-Cherr of UC Davis. "I don't recommend it as a cure-all, but as a way to get more of what's healthy into our diets," Zidenberg-Cherr is quoted. Chia seeds, she said, "deserve more study." The Associated Press launched a story yesterday about a resurgence of interest in growing food in home gardens, the result of "twin movements to eat local and pinch pennies." For the article, the newswire conducted a telephone interview of UCCE 4-H Youth Development and Master Gardener advisor Rose Hayden-Smith. "You always see an uptick in gardening activity in keeping with economic conditions - consumer-driven waves that emulate recession and inflation-driven economies," Hayden-Smith is quoted in the story. She compared today's market uncertainty with that of the early- to mid-20th Century, when the concept of "victory gardens" became popular in the U.S, Canada and Europe. "A lot of companies during the world wars and the Great Depression era encouraged vegetable gardening as a way of addressing layoffs, reduced wages and such," Hayden-Smith told AP. "Some companies, like U.S. Steel, made gardens available at the workplace. Railroads provided easements they'd rent to employees and others for gardening." The (Redding) Record-Searchlight ran a piece over the weekend with information about laws going into effect aimed at protecting new homes in California from the ember storm that precedes a fire and lingers after flames pass, as well as the radiated heat and flames of a wildfire. Reporter Laura Christman wrote that Steve Quarles, UCCE wood durability advisor, said the question whether the new laws increase costs will depend on a home’s size and design. Roofing and siding shouldn’t make much of a difference because most materials already in use comply with the new standards. “The costs will come from the decking and the windows,” Quarles is quoted. Christman also spoke to UC Berkeley's Max Moritz, who told her the new regulations will make a difference. “There is evidence that, out there in the real world, homes do burn for certain reasons and some homes seem to escape burning for certain reasons,” Moritz is quoted. For more from Quarles, view the new three-minute video about wildfire protection on the UC ANR wildfire online media kit. The video was created by UCOP's Larissa Brannin for Science Today. 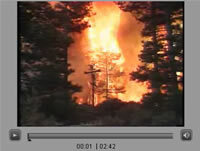 A frame from the fire video. The Associated Press reporter in the Fresno bureau, Garance Burke, posted a story on the AP wire today about "green ranchers," which has been picked up widely by newspapers in California and elsewhere, including the San Francisco Chronicle. The article says that ranchers haven't always had the best relationship with environmentalists, but a "new crop of cattlemen are quietly working to minimize their industry's ecological footprint and are forging unlikely alliances with environmental groups." Burke included a colorful quote from UC Cooperative Extension range management farm advisor Neil McDougald. "This new generation of ranchers knows they have to work on the environmental part of it to survive," McDougald is quoted. "I'll guarantee you the guys driving cows today have a better environmental conscience than the ranchers who were riding around holding up stagecoaches." Burke also spoke to Mel George, a range ecologist at UC Davis who, according to the story, said foraging has contributed to the erosion of arid Western rangelands and watershed contamination in the last two centuries. "The environmental movement has hit back with lawsuits seeking to ban cattlemen from running their herds on public lands," Burke wrote. Research and government programs highlighting how grazing can benefit the environment have helped make partners out of livestock producers and their adversaries, according to paraphrased comments attributed to George. Coordinator of the Common Ground Program for UC Cooperative Extension in Los Angeles County, Yvonne Savio, shared with an LA Times reporter her plans to grow the Japanese Trifele Black tomatoes this year. Savio is one of many gardening and food enthusiasts whose plans were sought for today's "Kitchen Gardener" story, which encourages the planting of unusual foods in summer gardens. In fact, the headline announces "Yellow strawberries and pink pumpkins -- it's time to plant for spring." Other unusual suggestions in the article include mentuccia, an Italian herb, and agretti, a feathery-leafed Italian vegetable. 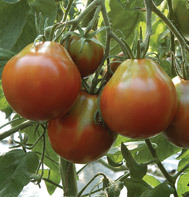 The Japanese Trifele Black tomatoes that will be grown in Savio's garden are an unusual pear shape and burgundy color, according to Johnny's Selected Seeds.